The University of Dublin and Loyola College, Chennai signed a Memorandum of Understanding and commenced University partnership between the two institutes to foster deeper futuristic relations. The agreement was signed by Professor Andrew J Deeks, President of University College Dublin (UCD) and Rev. Dr. M. Arockiasamy Xavier, S. J Principal of Loyola College in New Delhi on March 27, 2017. After the signing ceremony the significance of this new partnership was discussed by the President of UCD and Principal of Loyola College. Speaking on the agreement, Professor Andrew J Deeks said, “University College Dublin is pleased to commence a partnership with one of the highest ranked colleges in south India and we look forward to fostering deeper collaborations in the future”. Meanwhile, Rev. 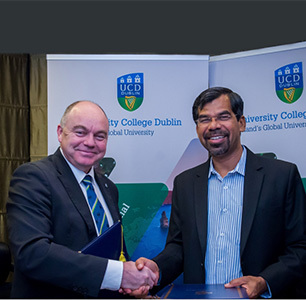 Dr. M. Arockiasamy Xavier, S.J, pointed, “This partnership between UCD and Loyola College represents an extremely promising opportunity as the historic and cultural synergies between the two institutions can lead the way to creating a mutually beneficial partnership in the field of humanities”. Other key members who were present at the occasion were Prof. Mary E. Daly, Professor of Modern Irish History, and Douglas Proctor, UCD Director for International Affairs. How much percentage do I need to score in 12th cbse to get admission in Loyola college Chennai for bba programme? Can science students apply for b.com at loyola college Chennai? Can science students apply for B.Com here? loyola college chennai has 2 shifts one is govt aided and other is self fiananced...can anyone explain the meaning....should we attend both? Your Loyola College, Chennai brochure has been successfully mailed to your registered email id .